Did I mention that I’m a fruit-as-a-savory-ingredient person? When my farm box is packed with greens, citrus and dried fruit, it only makes sense to put them all together. Cut four oranges into segments by cutting the top portion (about an inch) of the orange off, then the bottom portion (about an inch) and then cutting the skin away from the sides. Cut the orange into slices crosswise, then cut those slices into quarters, removing any seeds and excess pith. Squeeze the juice from the fifth orange into a large bowl, then add Dijon mustard, honey, salt and pepper to the juice. Slowly drizzle in ½ cup of olive oil while rapidly whisking the juice, until dressing is combined and thick. Taste for seasoning and add salt and pepper if needed. 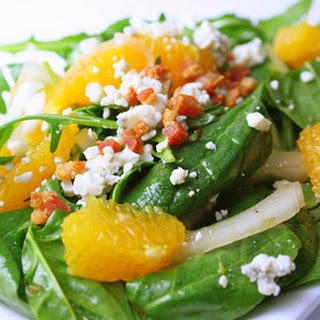 In a large bowl, mix half of the dressing with the arugula and onion slices, and gently toss together. Layer the oranges, dates and feta cheese on top, drizzling with more dressing, then serve.